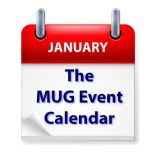 The highlights of this week’s MUG Event Calendar include not one but two virtual appearances by Bob “Dr. Mac” Levitus, one at a New Jersey group, and the other at a Pennsylvania group. Christian Pickman of Micromat will talk about their utilities at an Alaskan group, while a New Hampshire group will focus on cord cutting, and a New York group will cover 3D printing.